About 70% of people in NSW either ride regularly or would like to ride more, and say they would if bike riding was made safer for them. There has been a 50% increase in riding to work in metropolitan Sydney since 2006. This would be indicative across the State. Bicycle sales exceeded 1.4 million in 2012-13 and have outstripped car sales for over a decade. This trend continues. The NSW Government has an aim of reducing cycling fatalities and injuries by at least 30% by 2021. Cycling infrastructure is a proven method of reducing cycling fatalities and injuries. 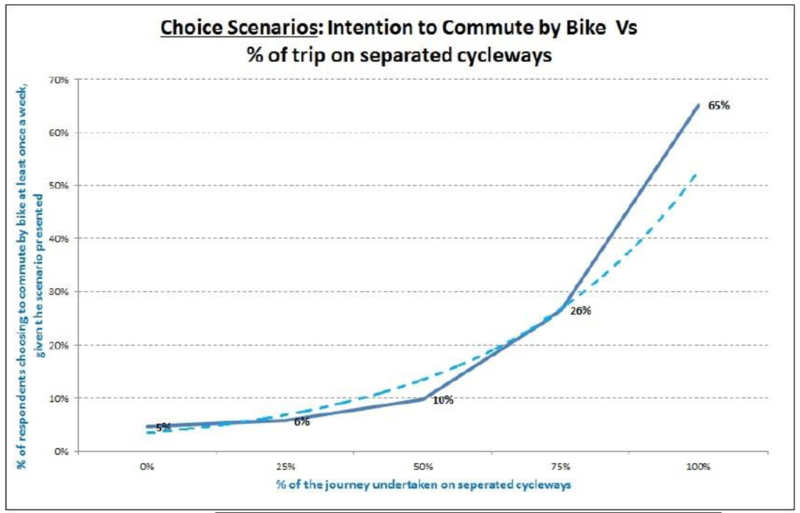 The NSW Government also had an objective of doubling the mode share of active transport to 5%. A primary method of achieving this aim is to consider cycling safety in every infrastructure project. This strategy is included in the RMS’s own Bicycle Guidelines policy (p5). The proposed F6 Stage 1 provides a unique opportunity to include high quality Active Transport infrastructure in this area. However, this Active Transport infrastructure must be included in the plans now and not as an afterthought. The M7 Motorway is a great example of good planning, with a parallel, grade separated shared path. The recent M4 Widening is a very poor planning example, where a golden opportunity has been lost to provide a safe separated cycleway. Out of the ~34,000 people travelling to Sydney Airport & Environs by car, a total of 11,589 come from this area. Out of the ~400,000 people travelling to the CBD and Environs by car, a total of 43,320 come from this area. That is, over 54,000 people travel by car from the F6 Stage 1 area to the Airport or CBD by car each day. A mode shift to Active Transport of 10% could reduce the number of cars by about 10%. This is far greater than the reduction in car numbers which is seen during school holiday periods when traffic congestion is much less. The net economic benefit has been calculated as $1.43 for every kilometre ridden. (ref Qld DTMR, 2010). The importance of completing the missing Active Transport links around Sydney Airport were recognised in the TfNSW plan “Sydney’s Cycling Future” (Dec 20113). More recently, “Future Transport 2056” (TfNSW) recognised this route as part of the Sydney Regional Bike Network. 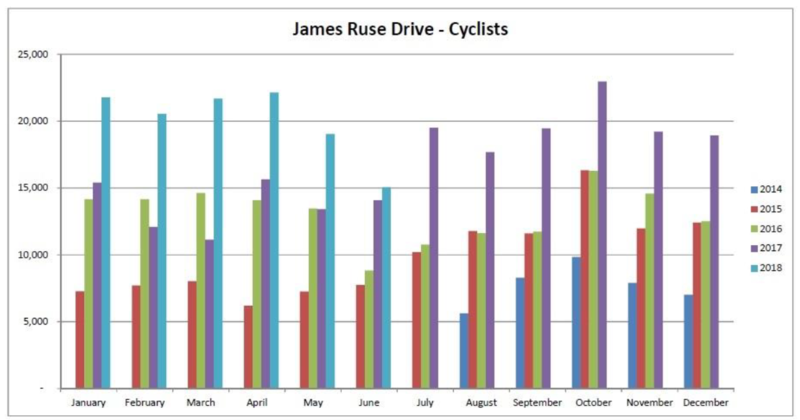 Too often in NSW have we seen disconnected cycleways being built and then criticised for low usage numbers. This is akin to building a short length of disconnected motorway and wondering why it’s not used! The same logic applies. What Active Transport Infrastructure should the F6 Stage 1 include? The F6 Stage 1 should include a separated Active Transport (AT) Link from Presidents Avenue to Sydney Airport. This link should be wide enough to also separate pedestrians from bicycle riders. This will be essential to “future proof” this AT Link given the anticipated number of future users. Anything else will be short sighted. This AT Link must extend from the southern side of Presidents Avenue all the way to the northern side of the Cooks River. An AT crossing of the Cooks River is essential to link with existing infrastructure at the Airport and along Airport Drive. For far, far too long has the disconnected AT debacle around the Via Giovanni Brunetti Bridge and Marsh St been allowed to exist. Not including this connection would be like building the F6 without a connection to the M5 – it would not even be considered! There is no better time to complete the AT Link across the Cooks River. The AT Link should integrate well with feeder paths on the south side of Presidents Avenue. It is good that a bridge over Presidents Avenue is being included in the Project. A separated cycleway should be provided along Presidents Avenue to the east to Botany Bay, and west to the Princes Highway. The AT Link should be off road all the way. It definitely must not include on road sections from Kings Wetland to Bay St and Muddy Creek. The RMS owns sufficient number of properties on both sides of Bay St to provide an off road path. These properties include the proposed RMS MOC 2. Any on road sections are barriers to less confident riders and essentially break the AT Link connectivity. The path must be wide enough, and allow pedestrians and bicycle riders to be separated. Why not plan for future use now and go for a total width of 5 metres? Too often have we seen the past provision of inadequate width causing pedestrian/cycle conflicts now. The ANZAC Bridge is a prime example. Due to the popularity of the Parramatta Valley Cycleway shared path, there are already plans to retrospectively widen it in places and separate riders and pedestrrians. Any “at grade” crossings of streets (eg Bay St and Bestic St) must include protected crossings for the AT Link where users have right of way. Separated cycleways should be provided along Bay St. These should extend west to Muddy Creek with a connection to Rockdale, and extend east all the way to Botany Bay. Depending on the final design of the AT Link, a new crossing of Muddy Creek at Bestic St may be required. The present circuitous shared path west of Barton Park (via Eve St), should be replaced by a more direct route. Proper on path signage, with a centre and dividing lines should be provided. Directional signage must be provided to/from the AT Link. Adequate lighting for night time is essential so as to promote usage and security. During construction, any diversions of pedestrian and bicycle riders must maintain safety. Diverting riders from existing off-road facilities, to shared on-road routes with vehicles decreases safety, and should not be considered as a viable option. We note that the State Government has set aside $2.4 billion for the F6 Stage 1. In the Project Overview document, we note that the “NSW Government is investing $41.5 billion on roads and public transport infrastructure over the next four years”. To put this in perspective, the F6 Stage 1 project will cost each NSW resident approximately $320. The total transport infrastructure budget is about $1,380 per person per annum for the next four years. And yet less that $40 million per year is spent directly on bicycle infrastructure, ie around $5 per person. The NSW 2018-19 Budget Surplus is estimated to be $3.9 billion. NSW clearly has the capacity to invest much more on Active Transport Infrastructure. An international standard would suggest around $30 per person per annum, or $225 million per year. This would still only represent about 2% of the total transport infrastructure budget.